S0708. 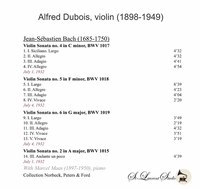 ALFRED DUBOIS & MARCEL MAAS: Violin Sonatas Nos. 4, 5 & 6 (all Bach). (Canada) St Laurent Studio YSL 78-532, recorded 7 Jan., 1932. Remarkably quiet transfers, from Royal Blue Shellac Columbia pressings, by Yves St Laurent. 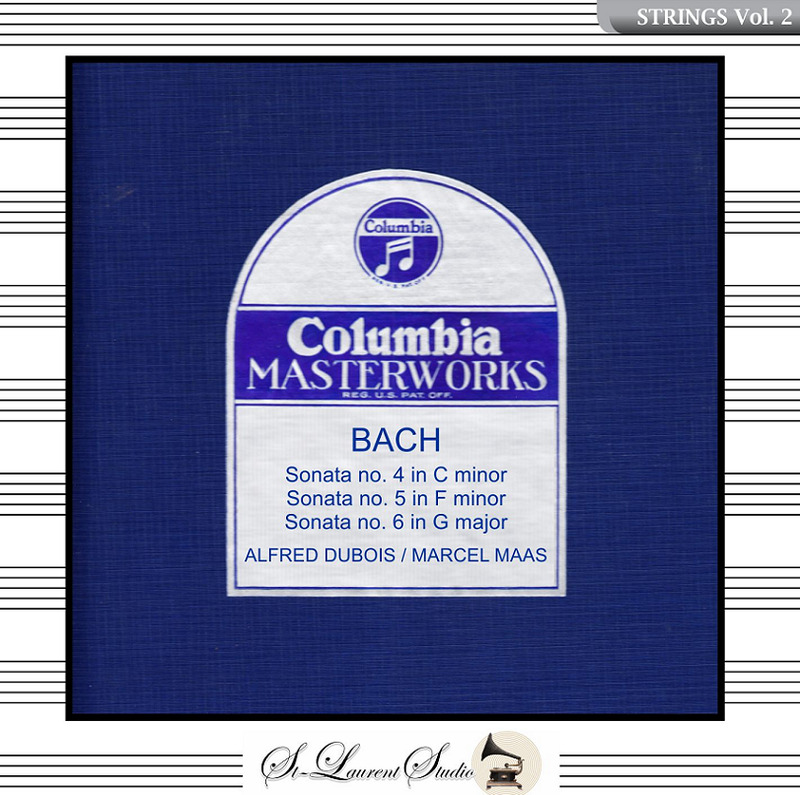 “In the heyday of the Franco-Belgian school of string playing, the little country of Belgium held almost equal sway with its neighbour France; and the conservatoires of Brussels and Liège were as prestigious as that of Paris. At the turn of the century, indeed, the supreme Belgian violinist Eugène Ysaÿe was regarded as the greatest fiddler then before the public. Somehow, after that zenith, Belgium lost ground. One reason was that Ysaÿe, though renowned as a teacher, did not leave as many artistic heirs as might have been expected. Pupils flocked to him from all over the world and drew both inspiration and technical assistance from him; but hardly any of them flowered as soloists. Carl Flesch summed the situation up: ‘Most violinists of my generation owe Ysaÿe an inestimable amount of indirect stimulation, but with the exception of the Belgian violinists Crickboom and Dubois none of his personal pupils has achieved any importance’. Of these two Ysaÿe pupils who made an impact as concert artists, Mathieu Crickboom – second violinist in the Quatuor Ysaÿe and dedicatee of the Fifth Solo Sonata – made no recordings. Posterity was more fortunate with that prince among fiddlers Alfred Dubois, though today even he is better remembered as the teacher of Arthur Grumiaux than as a star in his own right. Born at Molenbeek on 17 November 1898, the son of a painter and decorator, he entered the Royal Brussels Conservatoire in 1910. There he studied with Alexandre Cornélis and as early as 1911 won a first prize with distinction in solfege. An older Cornélis pupil was Alphonse Onnou, soon to be leader of the Quatuor Pro Arte, and Dubois was roughly contemporary with all the members of that ensemble. In 1913 he took the first violin prize and left the Conservatoire, but continued his studies with Cornélis until that master’s death in 1917. He then took regular lessons with Ysaÿe, to such effect that in 1920 he won the Vieuxtemps Prize presented by the City of Brussels – his trophy was a sculpture by Nini Philpart ‘representing a violin at a mirror surrounded to two angels’, to quote the librarian of the Conservatoire, where it is housed. Dubois was a busy soloist in the 1920s and 1930s. He formed a superb sonata duo with the pianist Marcel Maas (elder brother of the Pro Arte cellist Robert Maas) and from 1925 played in the celebrated Trio de la Cour de Belgique, with pianist Emile Bosquet and cellist Maurice Dambois. From 1927 he taught at the Royal Brussels Conservatoire in succession to Ysaÿe. Dubois toured the United States in the 1938–39 season, appearing as a concerto soloist and in recitals with Marcel Maas. Sadly the outbreak of World War II put paid to his transatlantic career; in fact he was one of those musicians for whom the hostilities came at the worst possible moment. In effect his career was cut off at the flood. During the war he organised the Quatuor Artis in which the second violinist was Grumiaux and the cellist was Robert Maas – who had become separated from the rest of the Quatuor Pro Arte when they went to America at the end of 1939. The violist was the magnificent Robert Courte, who later played with Maas in the Paganini Quartet in America. The Quatuor Artis would not play in public if any of the German occupiers were going to be present officially; but the ensemble gave many performances for their compatriots, including a complete Beethoven cycle under the auspices of the Société Philharmonique de Bruxelles in 1942. 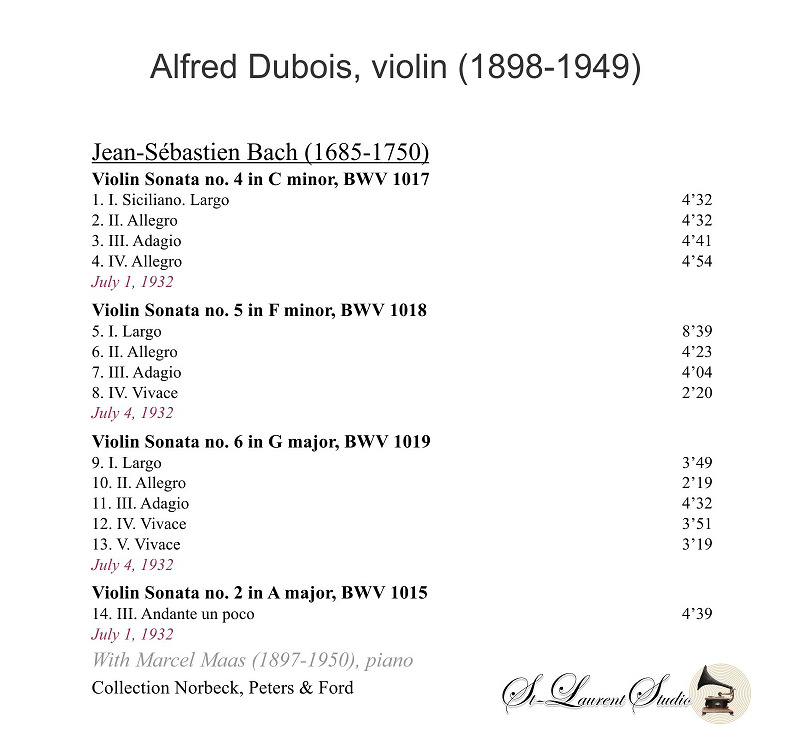 Dubois and the Maas brothers also gave important series of sonata performances, ranging from Vivaldi to Bartók. Alfred Dubois, described by Grumiaux as ‘a wonderful teacher’, died suddenly in Brussels on 24 March 1949 and was succeeded at the Conservatoire, as he would have wished, by his star pupil. He was not granted the time to re-establish his international career after the war and therefore his reputation does not stand as high as his artistry warranted. But his colleague Bosquet was not exaggerating in writing of Dubois: ‘The virtuoso, in addition to his qualities of simplicity, of perfect equilibrium between instinct and intelligence, of great reliability of technique, impressed one irresistibly with the charm of his sonority and his phrasing’. The chamber musician possessed a musicality without defect and an easy adaptability to all styles, both old and new. As a teacher, Dubois attracted pupils from as far afield as America and China; and had he lived to be a grand old man, he would undoubtedly have helped to restore the glory of the Belgian school. As it is, we can trace a direct line from Ysaÿe through Dubois to Grumiaux and the latter’s French pupil Augustin Dumay, who continues the Ysaÿe tradition today. Alfred Dubois’ relationship with the violin went deeper than that of most of his colleagues, as he took a keen interest in the luthier’s craft and was himself a maker of professional standard. Though he did not have the leisure to make many instruments, his skills proved invaluable on tour when running repairs were needed.